Will continuing North Korea tensions affect the world economy? North Korea's recent plays for power may bring about a host of consequences for the rest of the world, and in a difficult political climate, the country's relationship with China, Japan and western nations will naturally be under close scrutiny. Consequently, this raises the question: Can events with a potential global impact affect the world's economy or markets? The answer might surprise you. Citi analysts says that equity markets have actually proven remarkably resistant to geopolitical conflict over the last century, with very few world events causing lasting impact on markets. The last 75 years have been as turbulent as any in world history. But while Pearl Harbour, the assassination of John F. Kennedy and the events of 9/11 – to name just a few – have undoubtedly changed and shaped society as we know it, they've done surprisingly little to affect the overall state of world finance. In fact, recent studies by Citi analysts found that while there is often an initial shockwave that sends markets into disarray, that fall in value is often remedied, or even improved, within just 30 days. To use a current example, equities have already started to recover from a fall in value in the immediate aftermath of North Korea's missile test, with safe haven asset flows reversing. There have only been two exceptions to this trend – World War II and the Arab oil embargo. These events both caused a rationing of critical energy supplies, and the strains on resources both significantly affected market recovery. Despite ongoing tensions between North Korea and the US, the world economy continues to improve and Citi analysts believe current geo-political issues to have little impact. The US itself continues to be a strong presence in the world economy. Indeed, in August 2017, the US ISM Manufacturing index climbed to 58.8, its highest peak since 2011. Even the recent devastation of Hurricane Harvey did little to dent the economy; the decrease in US GDP growth is predicted to be just 0.1%, and the repair work will likely see a small boost in numbers through the coming quarters. What does this mean for the current tensions? We've all seen how shock election results or political movements can see both markets and confidence plummet in just a few hours, but history shows that a strong economy will often see equity markets returning to normal levels within 30 days. 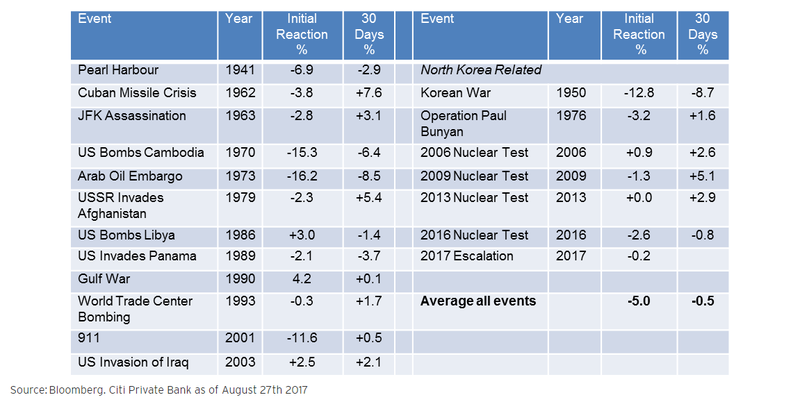 With the US continuing to be a dominant presence in global finance, any initial decline due to events in North Korea will likely be short lived. However, with the scale of recent uncertainty due to Brexit and Donald Trump's tumultuous presidency, it's always a good idea to keep a diverse portfolio to weather uncertain climates. Find out more about the best options for limiting risk on your portfolio and, as always, don't hesitate to speak to your Relationship Manager for more information.